A Perfect Storm is hitting the Gold market, with an internal factor (QE), an external factor (SGE), and a systemic factor (Basel). All three forces are positive in releasing Gold from the corrupt clutches of the Anglo-American banker organization. The East has an all-out blitz to ditch the USDollar and to adopt the Gold Standard in its early form, namely trade payment. In the last ten years since the Lehman Brothers failure, all systems have undergone the same reckless treatment that the mortgage bonds endured. Slowly the realization is coming to the fore, stated by a few astute analysts. In the last decade, the US-UK banksters have created the USTreasury bond as the global subprime bond. This is the result of astounding persistent magnificent QE abuse, debt explosion, and hidden corruption. The so-called financial stimulus is actually hyper monetary inflation, which has destroyed the bond market. There are no legitimate USTreasury buyers outside the US foreign vassal states. The perfect financial storm will be three to five times worse than the 2008 financial crisis that engulfed the subprime bond market. The corporate bond market is turning gradually into a $trillion BBB junk bond field and broken bone yard, after years of abused bond issuance devoted to share buybacks and executive options. It can be stated with accuracy that the entire global bond market is subprime, led by the USTBonds. In the last ten years, absolutely nothing has been fixed, no remedy even attempted, while all the errors, crimes, and reckless monetary policy that created the Lehman fiasco with the Global Financial Crisis, have been repeated on a global scale. Debt has exploded globally, and especially in the USGovt finances. The great unfolding crisis will engulf sovereign bonds, national banking systems, and major corporations. For the last ten years, the USD-based money supply has almost tripled. The process created a coiled spring. The Gold price is due to triple in compensation. Much lost time will be made up for. It just needs some internal, external, and systemic pushes. The Gold market will never let a crisis go to waste; it will respond. The unfolding global crisis will expose the USTreasury Bond as toxic, the new subprime bond. It will struggle to maintain the safe haven status, but lose the battle. Gold will assume the safe haven status, along with other undetermined hard assets. Attempts by the Basel bunch of uber-bankers, who have no official authority over the Western central banks, will change the course of banking history. That Gold is made a risk-free Tier-1 asset will put forth a direct challenge to the USTBond in banking reserves. All systems will change. The GLD Exchange Traded Fund can serve as a very reliable early warning signal for a very tight gold supply, and corresponding Gold price upward moves. It signals shortage and tight supply now, with a divergence between London Gold price versus GLD Fund inventory in tonnage. Consider a lesson on the GLD Exchange Traded Fund. Some preliminary remarks are necessary. It is a fund to deceive the public, whose prospectus is routinely violated by the London banksters. The GLD Fund is used as a magnet for naive ignorant lazy investors, lured to think they own gold. While they might enjoy the upside potential in the Gold price, their investment is a major vehicle used to keep the price down. Its inventory is raided by the US-UK banks, and sold into the market in regular frequent events. The big investors are often denied access to physical gold delivery, since not club members at the big banks, a violation. Nobody enforces the rule. The inventory contains real gold metal, but it is a massive vat for discharge into the market in pure price suppression by the criminal banker set. They manage the fund like a criminal slush fund. With each raid on the GLD vault, the LBMA official Gold price comes down. Notice the tight correlation in the graph below, except in recent months. Evidence is clear. A divergence can now be seen, from the clear signal between the LBMA Gold price and the critically low GLD vault inventory. The Gold price is going up, while the GLD inventory is going down. Since three months ago, the divergence has begun to show itself. The chart shows data through February of this year. Another key but subtle point of interest. 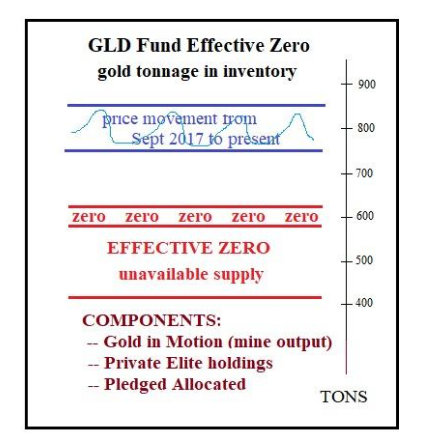 The official inventory level of the GLD Fund includes gold in motion, a term to describe delivery from mining firms that is in transit. It is never truly in the vaults, since when a delivery is made, another delivery is in motion under new contract stipulation. By that is meant not just trucks loaded with bars, but trucks loaded with concentrated ore heading to refineries, plus bars under contract delivery within the quarter (three months). Furthermore, other gold shows up in the GLD inventory, but it is not available, such as private elite accounts, even pledged allocated gold. Therefore the effective zero level is far above the posted zero level, which is often estimated by the expert analysts (like EuroRaj) to be around 400 to 600 tonnes gold, very much unknown. This is an important point, since the official GLD inventory is just above 750 tonnes currently. It has varied from 750 tonnes to 850 tonnes in the last 18 months, now near the effective zero mark. As the GLD vaults reach effective zero, the Boyz on Wall Street and London Centre lose the ability to reach into the vaults overnight in dumping exercises intended to pull the Gold price down. They essentially have a tool taken away. Consider sage words from a Jackass colleague. The purpose of GLD is a private warehouse run by the Bank of England. When the public demand or central bank demand has to be met, they raid the inventory by redeeming share baskets and remove physical bars overnight. The redemption of shares is an act of selling of the paper that drives prices lower, when more exactly the process is actually driven by drainage of physical at this banker slush fund. There is physical gold but it belongs primarily to BOE and certain billionaires. The sheeple cannot get access to it unless they pony up enough cash for 10,000 ounces, and even then, they are often denied the metal. Since the USFed went dovish in December in a reversal of language away from further tightening, and toward more easing, the Gold price has been going up while the GLD Fund tonnage has been going down. The Big Boyz know the RESET is here. Refer to the divergence in progress for the last three months. The clear signs of physical gold drainage lead to growing distrust in the entire USDollar & USTreasury framework like a creeping slow motion cancer. Gold drainage affects the delicate Supply & Demand equilibrium. The result is an assured imminent situation that reeks of financial instability. The true refuge will be Gold held in personal possession or with trusted access by agents. The irony could be that broken trust of the GLD Fund and broken trust of the LBMA/COMEX, complete with lawsuits, could bring down the paper game and lead the masses into true physical Gold holdings. For more background and other discussion, see Sprott Money (HERE) with a Craig Hemke interview. The next stage for global finance will incorporate regional structures and platforms. The entire community of nations is making major adjustments as preliminary preparation to the Global RESET, in order to minimize the shock, disruption, and potential chaos. Expect regional themes to dominate, as the Dual Universe comes into form. The East will prefer to trade in Chinese RMB terms, and often in Euro terms. The West will prefer to conduct trade in USD terms, but also British Pounds in trace amounts within the old colonies. A dichotomy has formed with great geopolitical division amidst hostility and trade friction. The entire USFed QE initiative, coupled with unbridled $trillion USGovt debts, has fostered a rebellion amidst visible bond fraud. The rest of the globe is in active revolt, whose movement gains momentum each month. The transition period will involve the two dominant currencies at work: the USD and RMB. The USDollar will not go away quickly or easily. It is well rooted in trade payments systems, in credit systems, in banking systems, and more. The entire Langley seven silos of corrupt illegal enterprises (narcotics, weapons, human trafficking, human organs) are based in the USDollar, with gargantuan savings accounts and business investments. They will not go away anytime soon, which dictates an interim period. The Dual Universe has been born, without much fanfare. The Chinese RMB is to be the designated caretaker, used for ushering in the Gold Standard. In the meantime, the United States will face an acute risk for the transition. It must assure import supply. The USTreasury Bill will no longer be trusted, or even accepted, following the RESET. Entirely new trade payments systems are coming, and the US will lose its privilege of paying for hard goods with phony money and IOU coupons. The USTBill has a fraudulent backing, an unlimited supply, fraudulent masters, and is coupled with massive debt which is widely seen as unpayable. The US must adapt to the Gold Trade Note in usage. It must contend with shortages and rising prices, following import supply interruptions. It must share global power, while losing the exceptional status. It must ward off isolation. It must reindustrialize. It must pay down the $22 trillion debt. It must source gold for the new currency. It must face the risk of a stark reality in the New Scheiss Dollar, a Third World conception, provided the USGovt resorts to its usual fraudulent finances. Jim Willie CB is a statistical analyst in marketing research and retail forecasting. He holds a PhD in Statistics. His career has stretched over 25 years. He aspires to thrive in the financial editor world, unencumbered by the limitations of economic credentials. 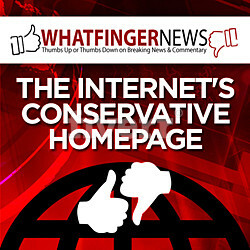 Visit his free newly revamped website to find articles from topflight authors at www.Golden-Jackass.com. It now has a hyphen in the URL address. For personal questions about subscriptions, contact him at JimWillieCB@gmail.com.